Derby Motors Copnor Ltd - Garage/Vehicle Services based in Portsmouth, Hampshire. 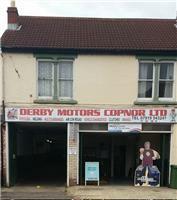 Derby motors Copnor Ltd has been going for around 3 years Paul the owner has been trading for around 18 years plus under a different name and been working on cars and bikes most of his life. We pride ourselves as being an honest garage and try to help customers as much as possible. We have a lot to offer in every way i.e. Clutch replacement, cambelts replace or just a service we have full diagnostic equipment as well. We also arrange Mots for cars. Servicing everything that you could possibly need doing to your car. We are also terraclean agents for Portsmouth which includes engine decarbonisation of the engine and DPF cleaning, air conditioning and repairs, motor cycle mots done in house and motorcycle repairs and servicing. Havant waterloovile Hampshire, Portsmouth, Southsea.